This 1:12,500 scale (1.5 x vertical exaggeration) 3D model of an area located North of the Waka National Park, Ngunie Province, Ikobey commune, Gabon, was completed over the period July 2010-June 2011. 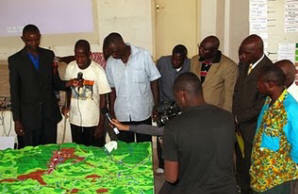 Covering a total area of 62,500 ha or 625 km2, it has been the first Participatory 3D model constructed in Central Africa. Depicted data reflect the mental maps of approximately 40 Babongo and Mitsogo Peoples from 14 villages. Adults populated the model with their memories and reconstructed the present landscape . The model displays 35 data layers including different types of areas, points and lines. 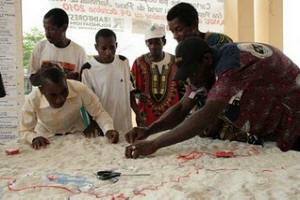 The blank model has been constructed by the students from the Primary School of Fougamou. 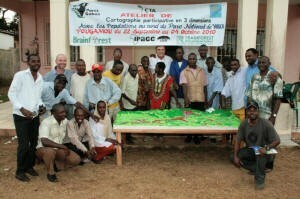 As part of a region-wide effort aimed at involving local communities in the sustainable management of natural resources in the Congo Basin and at adding value and authority to local and indigenous knowledge and values, and at ensuring equitable benefit sharing resulting from co-managed protected areas, the Agence Nationale des Parcs Nationaux (ANPN), Brainforest, the Technical Centre for Agricultural and Rural Cooperation ACP-EU (CTA), the Indigenous Peoples of Africa Coordinating Committee (IPACC), MINAPYGA, the Rainforest Foundation UK (RFF-UK), and the Wildlife Conservation Society-Gabon (WCS), supported a series of initiatives in Gabon including the participatory 3D modelling exercise described on this page. 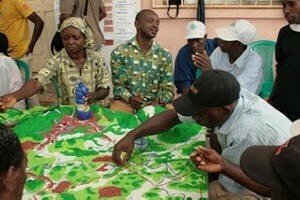 While responding to needs expressed by local communities and by the park administration, the exercise offered the opportunity for training delegates from national and regional organisations based in Cameroon, Republic of the Congo, Central African Republic (CAR), Chad and the Democratic Republic of Congo, Gabon, South Africa and the United Kingdom. The supporting agencies assisted Babongo and Mitsogo community-based organisations in entertaining negotiations with the protected areas management authority on their role in the management of the buffer zones and in defining – among others – benefit sharing mechanisms. If successful, the process is likely to be upscaled and replicated in other protected areas in the country. Accompanied by effective advocacy it may also impact positively local policies and legislation. The exercise benefitted from the coordinated effort made by the Babongo and Mitsogo Peoples, the Agence Nationale des Parcs Nationaux (ANPN), Brainforest, the Technical Centre for Agricultural and Rural Cooperation ACP-EU (CTA), the Indigenous Peoples of Africa Coordinating Committee (IPACC), MINAPYGA, Rainforest Foundation UK (RFF-UK), and the Wildlife Conservation Society-Gabon (WCS).